The Supreme Court has ruled that the Professional and Amateur Sports Protection Act of 1992 is unconstitutional and the floodgates are about to open, with legalized sports betting expected to be up and running in dozens of states within the next few years. There’s little doubt this wouldn’t be the case if not for Dennis Drazin, chairman and CEO of Darby Development, operator of Monmouth Park. Never giving up despite several defeats in lower courts, Drazin spearheaded the effort to have legalized sports betting in New Jersey and, in particular, Monmouth. 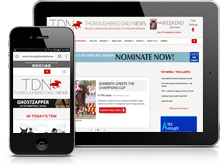 Drazin is this week’s guest of the Thoroughbred Daily News podcast, brought to you by Taylor Made.